After looking at 5 million pictures of towering, melting, drool-inducing ice cream cones on her Instagram feed F&W's Kate Krader realized this: We’re in the golden age of ice cream. After looking at 5 million pictures of towering, melting, drool-inducing ice cream cones on my Instagram feed I realized this: We’re in the golden age of ice cream. There’s lots of people and institutions to thank for this. On the old-school front: Baskin-Robbins has introduced attention-getting flavors like State Fair Fried Dough (chunks of funnel cake and fried dough in caramel ice cream, hello!!). Also, some amazing, already-beloved ice cream stores are expanding: Jeni’s has set up shop in Charleston, South Carolina, and Salt & Straw has opened in L.A. My heroes Big Gay Ice Cream are opening in L.A. and Philadelphia. At this brightly lit spot in downtown New York, the lines are even longer than they are for the nearby clubs. Morgenstern’s specializes in flavors like Salted Pretzel Caramel and Brazilian Bourbon. The sundaes are especially insane: King Kong Banana Split (bananas, ice cream, sesame caramel and pineapple) and Good Morning Vietnam (Vietnamese Coffee ice cream, condensed milk caramel, coffee cake and cream). The husband-and-wife team of Erika Thomas and Chad Stutz launched their shop because they love ice cream (yay!!). In addition to a menu of 18 rotating flavors (like Basil with Blackberry Swirl and Brown Butter Pecan), their signature snack is the Bombe—an insane-sounding cake made of meringue sandwiched between two kinds of ice cream. If you want more options, they also offer five-flavor ice cream flights. In the gorgeous 1920s Spring Arcade Building in downtown L.A., this new gelateria serves 16 rotating flavors daily with options that tend toward the inspired like the shortbread cookie–flavored Speculoos and Coconut Lemongrass. You can check out a more complete list on their website, which is also the place to request a flavor you’d love to see them make. Co-owners Sandra Tran and Gil Welsford started their business last year as a pop-up at local farmers’ markets and restaurants; in May they opened their brick-and-mortar shop. At Nicecream, all the ice cream is freshly made. Literally. It’s made right in front of you using local ingredients and liquid nitrogen, which, Tran says, makes the ice cream taste fresher and creamier since it’s not sitting in a freezer for hours. It also creates a super-cool cloud of vapor. Flavors range from strawberry to pistachio and bacon-studded chocolate. In the hipster epicenter of Williamsburg, OddFellows makes 100 flavors of ice cream, offering 12 to 14 options at a time like S’mores, Buttermilk Biscuit and Thai Iced Cream. They’ve just opened a brand-new location in Manhattan’s East Village; odds are they’ll start creating even more genius flavors. 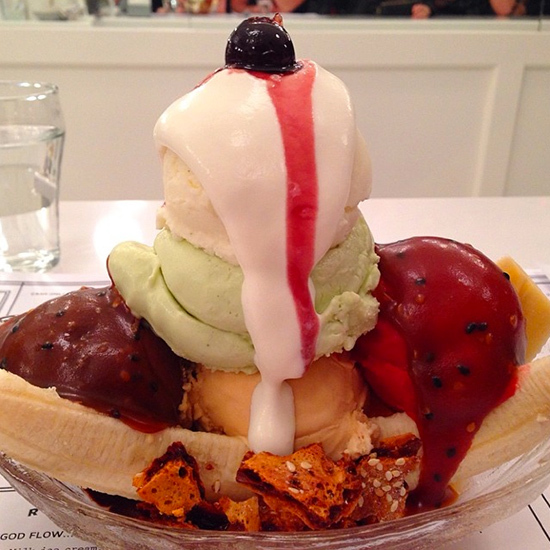 OddFellows bonus: They donate 5 cents to the Food Bank for New York City for every serving of ice cream sold. This Irish-themed parlor uses Plush Horse ice cream for specialties like Cone o’Flake (soft serve with the iconic Chocolate Flake bar), flavors like Baileys Irish Cream and Jameson, and sundaes like the Irish Wake Up Call (Irish Breakfast and Maple Bacon ice cream, hot fudge, whipped cream and cornflakes). What started out as an ice cream bus (dream come true!) in 2011 from the husband-and-wife team of Yoni and Vanessa Mazuz is now a shop that features hand-churned ice cream made as much as possible from local ingredients. Their hyper-seasonal flavors include Summer Corn, Blueberry Cheesecake and Vegan Chocolate. Toppings, like Pralined Pecans and Espresso Whipped Cream, are equally artisanal.